I recently co-presented a session on GIS and the Smart Grid to a group of about 150 folks from the gas and electric utilities and the telecommunications businesses. We thought it might be interesting to have the groups come together since as more and more utilities implement Smart Grid (electric and gas), there will become greater interdependencies on one another. We further thought that this session would be a great opportunity for each company to tell us their current practices on sharing data, problems and issues. The premise was, of course, that since ArcGIS is a platform which facilitates sharing of information, that both groups could give us feedback on how best to facilitate collaboration. Much to our surprise, the groups do not have much collaboration at all. In fact, they hadn’t really considered it very seriously. When I probed them further, I asked, well how do you share information with each other? One utility guy, perhaps, half-jokingly said that he bought his friend from the phone company a beer and that’s when they shared information. The biggest take away from this session was this: the discussion on this topic hasn’t really started. It should. 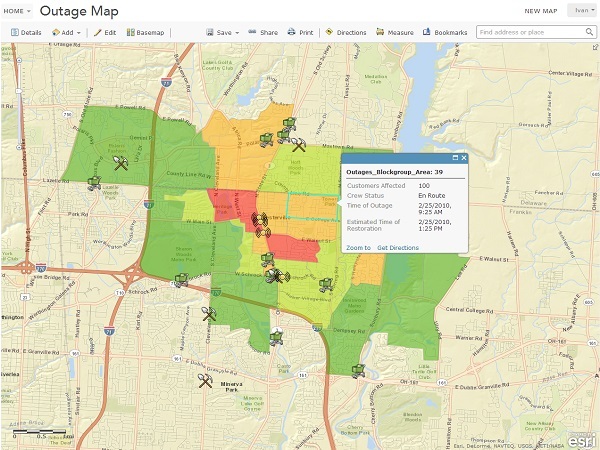 Sharing information in GIS, such as estimated time to restore outages, can have benefits for utilities and communication companies. Utilities and telecoms are increasingly dependent on one another, particularly during emergencies. Power failures severely impact telecommunications companies. They need power to cell towers and routers. They have backup power, but that only lasts for so long. It seems that the way they get the information about outages is by calling the power company, just like every other customer does. These companies need to know where to deploy generators. They need critical information on damage extents and time estimates to restore power so they can effectively respond to trouble. Likewise, the electric company relies on telecommunication systems to be working as well. Many electric companies have their own private radio systems to be sure, but most field employees use smart phones, which of course rely on cell towers, which by the way rely on power. As utility companies roll out Smart Grid, they will be relying completely on the effectiveness of the telecommunications network. Some utilities will build their own networks, but many will need to count on commercial providers or some combination of their own networks and commercial telecommunications networks. Despite the interdependencies, it turns out that with or without Smart Grid, electric utilities (and to a lesser extent gas utilities) and telecommunications companies as a practice don’t share much information beyond some contractual joint pole use data. They certainly don’t share with one another real time situational awareness information during major emergencies. Certainly doing so would reap major benefits for both entities. Gas, electric and telecommunications companies also do damage assessment quite independently. Wouldn’t it make sense to share their damage assessments (using ArcGIS of course) with one another? If a tree takes down a pole line, this event is likely impacting both the electric company and the telecommunications company. A gas main fire certainly will impact the electric and telecommunications companies. Sure the folks from the gas, electric and phone companies can call each other or share a beer, but an automated system of collaboration would save a lot of time In fact, the companies would benefit from sharing and consuming data from first responders and other emergency agencies. Wouldn’t the electric, gas and the telecommunications companies benefit from finding out about flooded roads, bridges out, wild fires, shelters open or closed, debris in the road or even crazy people shooting guns? ArcGIS is a platform for change and transformation. Crafting a sharing framework among electric, gas and telecommunications (and water, public works, transit) companies and many other agencies would transform the way these organizations respond to emergencies and even some routine matters.